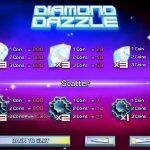 Diamond Dazzle is a three reel slot game by Rival. This is a very classic 3 reel slot meaning you need all three symbols in one row in order to win. As the name suggests this is all about gems where the biggest prize is won by having the rarest of them all – The black diamond. The biggest win can be 1500 coins. 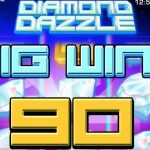 White diamonds are plentiful and their top prize can be 600 coins. Other gems are rubies, topaz, emeralds, sapphires and amethysts. As you can figure out, many gems are spinning so logic suggests it might be hard to get 3 identical gems in a row but surprisingly that’s not the case. As we discuss soon there’s no bonus stage but with the options the black diamonds can brings a payout is not that hard to get. No bonus stage per se but… The black diamonds, which are the highest paying symbols, can trigger payouts. If you get them anywhere on the reel you trigger a payout. One of them has to be featured on each reel for a valid combination, but no need for them to be seen on the line. White diamonds if mixed, will also allow payouts to occur. All other symbols need to be in one line to generate a reward. 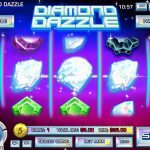 Diamond Dazzle might seem to be a simple slot game but it is a dazzling and enticing one all the same. It is a classic but with few surprises that up the experience and bring you more wins. It’s not always clear when you play how the payables work but like we wrote, this game is fun and satisfying! Love 3 reel slots but prefer something with a bonus stage? Try Pistols and Roses, a 3 reel slot by Rival.